Situated along the winding mountain road that is the historic village of Omori, Takyo Abeke is hidden behind a rustic bamboo fence covered in climbing roses and shielded from the road by a deep courtyard garden. The 228-year-old building was once the home of the Abe family (Abeke), who were administrative officials for the Iwami Ginzan silver mine dug deep into the mountains at the top of the village. During the 17th and 18th centuries the silver mine was the largest in the world, and its output financed not only bustling local village life and imposing houses like Abeke but also Japan’s rapid economic growth, urbanization, and flowering of its unique culture of shibusa— aesthetics based on nature, simplicity, and the ephemeral—during the first centuries of the Edo period (1603-1868). Although the silver mine played out long ago, leaving Omori destitute and nearly deserted by the end of the last century, today it is one of the most picturesque and livable villages in Japan. Many of its historic buildings have been spectacularly restored, its natural environment is protected by a ban on cars for a good portion of its valley location, and its handsome red-tile-roofed homes and their colorful courtyard gardens are well-maintained by its 400 citizens. All this plus a revitalized local economy are largely due to the vision and efforts of Tomi Matsuba and her husband Daikichi who moved to Omori in 1980. Coming to the village to escape the increasing challenges of life in Japan's big cities and to raise a family (Omori is Daikichi's hometown), they were inspired by the beauty and way of life they found and launched the Iwami-Ginzan Lifestyle and Culture Laboratory, a company whose aim is to preserve Japan's rural heritage and make it relevant to modern living. Known by its brand name Gungendo, this very successful indie company makes clothes, household items, and food products with natural materials sourced sustainably, artisanal skills embedded in tradition, and designs inspired by rural aesthetics yet are contemporary and functionally modern. 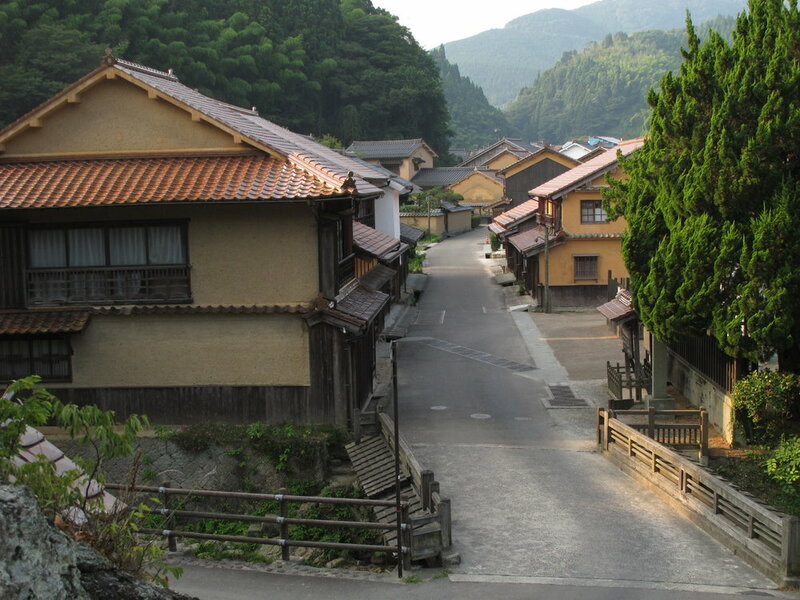 Omori is essentially one long road of traditional homes, shops, cafes, shrines, and temples that parallels the course of a rocky stream winding through the folds of the deeply-forested mountains of central Shimane prefecture. The Gungendo company's headquarters and design center in Omori have been thoughtfully designed to fit into the landscape and incorporate Hinaya, a 250-year-old thatched-roof house, into the complex as a meeting and event space. Tomi and Daikichi also bought the old Abeke family house, and restored and updated it to create a fully-realized, complete world of their vision of the beauty and richness of everyday country life. Opening it as a guest house, Takyo Abeke is one of the most aesthetically pleasing, physically comforting, and spiritually enriching places to stay in Japan. What the Matsubas have done at Takyo Abeke is renew Japan's classical concept of shibusa aesthetics and apply it to all aspects of everyday life in an integrated way. Historically, and perhaps counter-intuitively, shibusa, which is the appreciation of nature, the ordinary, and imperfect, was largely a sophisticated urban concept that spawned such specific art forms as ikebana flower arranging, kaiseki seasonal course meals, and chado green tea-drinking ceremonies among wealthy city residents. By applying shibusa to country life, the Matsubas have brought the concept back to its roots so to speak. They have also enriched it by infusing it with the rural values of omotenashi, or selfless hospitality, shimatsu, or the respectful use of nature, and community. They have also added aspects that were missing from the original aesthetic—the eclecticism of everyday life and the practicality of the ordinary. In effect, the Matsubas have made daily life an art at Takyo Abeke. “Some may say that this small, remote town in the shadow of the mountains has little to offer, but living here has revealed a myriad of hidden treasures. My wish is to share these treasures with as many people as possible,” Tomi Matsuba, hostess of Takyo Abeke and president and designer of the Gungendo brand of clothing, household items, and food products. Made from tea bushes grown in the shade and laden with umami, gyokuro is the richest tasting type of green tea. In summer it is served cold in a hand-blown pitcher and glass to guests upon their arrival. Takyo means “one’s own home,” and Takyo Abeke is a home in form and spirit. More than that, it is what most people dream of for a home—comfortable and relaxing, beautiful and luxurious, nourishing and inspiring. Takyo Abeke consists of private and shared rooms—places to be and places to share—woven into a maze of corridors, courtyard gardens, and several old buildings on the property. It is a warm and casual place, and guests can freely move about the house, experiencing each room and its different sensory experience. Throughout there is a layering and juxtaposition of beautiful objects, colors, patterns, and textures and also the orchestration of light, darkness, and shadows to stimulate the senses and heighten an appreciation of the everyday: its comfort, beauty, and purpose. There is a warm tranquil study with its own small courtyard garden that is filled with everyday objects and curios to prompt reflection and inspiration. Opposite the study in a renovated kura, or storehouse, is a bar in which to relax and socialize. It is a dark, unusually spare room because the focus is on human interaction. The bath, located in a renovated barn at the back of the property and reached by a covered outdoor corridor, is completely sensory. It consists of two rooms: a changing room and, through a door and down a few steps, the bath. Hewn bamboo floors, rough grass mats, wooden chairs and benches, and hand-woven towels in the changing room are invigorating. The silky feel of the bath's stone floor on your feet, its herb-scented water, and the flickering shadows created by candles at night are soothing. Adding to the room's seductiveness is the scent of flowers when the bath is open to its private garden in good weather and the steam created by a wood-burning stove in cold. Even the corridors at Takyo Abeke are layered with materials, textures, and small intriguing objects to attract your attention, thereby slowing your pace as well as stimulating your senses. The eclectic yet tranquil study looks out onto a small courtyard garden. Takyo Abeke's three sets of bedroom suites are luxurious retreats. Each one is differently laid out; all are deeply quiet and furnished to help you transcend the physical and transport you to a world of imagination and dreams. Guest pajamas are hand-woven of double-layer gauze with two different weaves to feel light on the skin and protective on the surface. The bed sheets are made of sasawashi, an organic fabric that is a blend of traditional washi paper (hand-made from tree bark fibers) and the leaves of the kumazawa plant. 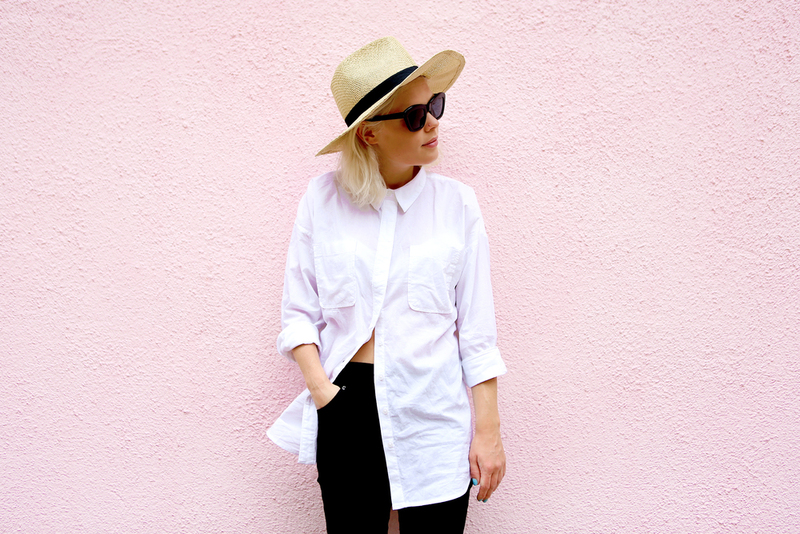 Soft and comforting, they are cool in summer and warm in winter. (They are also good for your health because of the plant material's anti-bacterial properties.) The coverlets are woven from hand-made yarns of different colors and textures and changed each season. 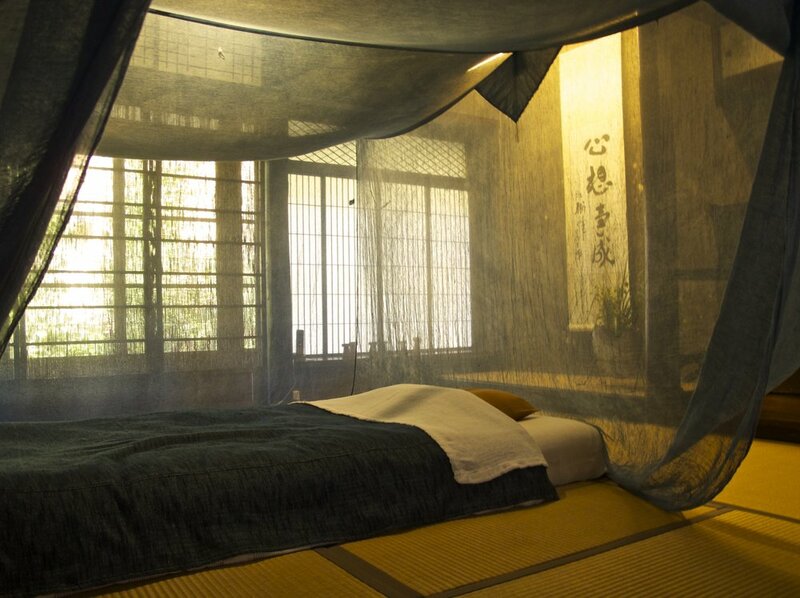 In summer, the kaya, or mosquito nets, that hang over the beds create an especially magical atmosphere and are a welcome accessory even if you decide to use air conditioning rather than leave the windows open to the cool nighttime breezes coming down from the mountains. The kaya are dyed with dark-blue indigo, a natural insect repellent. The Okunoma bedroom suite is the largest and consists of one to two bedrooms, a sitting area, and its own bathroom. 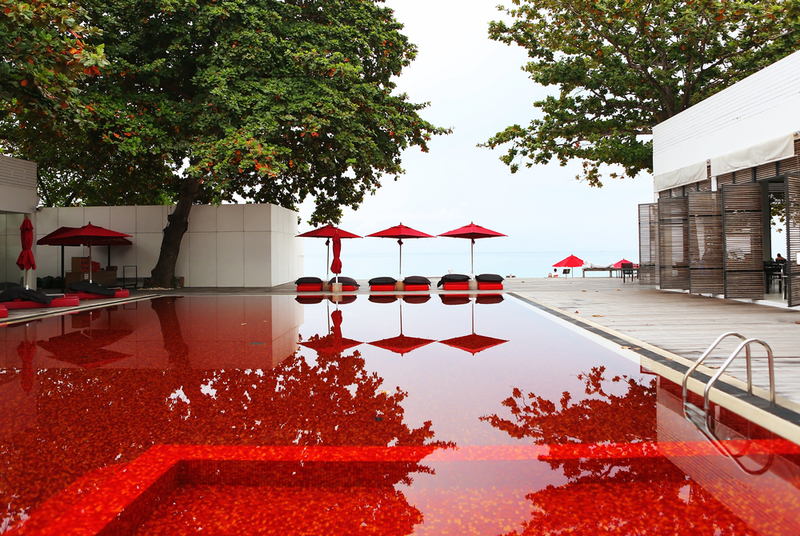 Two charming courtyard gardens are located on each side of the suite. All of the rooms at Takyo Abeke are situated around the daidokoro, a word that means "the kitchen" in Japanese and which implies the hearth of the house. Literally, daidokoro means “the big place,” and the daidokoro at Takyo Abeke is a large magnificent room that combines cooking and eating areas separated by a kamado, a traditional wood-burning stove that is made of clay and uses iron pots for cooking. From three o’clock onwards each day chef Takuro Onodera and his team fill the house with the gentle sounds and delicious smells of their cooking. Dinner at Takyo Abeke is when all of the values of the guest house combine to express their beauty, richness, and meaning as well as excite the senses. It is a communal affair. Guests eat together and Tomi joins when she is at Omori. The food is generous, and the dishes creative, healthy, and deliciously rich-tasting due to the use of hakko-shoku, or fermented foods; the magical ingredient that makes Japanese cooking light and clean-tasting yet deeply flavorful. The dishes showcase the best ingredients that Shimane's farmers and fishermen have to offer. Fresh, seasonal vegetables grown in the kitchen gardens of neighbors. Seafood caught daily from the Sea of Japan: iwagaki, or rock oysters, (the Oki Islands offshore are one of the two best places in Japan for these oysters; the other being the fishing village of Ine), matodai, or John Dory, and nodogoro, or Black Throat Sea Perch, a highly-prized tender and fatty white-fleshed fish with a rich sweet taste. Shimane's famous meats include exceptionally lean and tender Shimane wagyu beef, full-flavored Iwami pork, and kuro-kashiwa chicken, which is a domestic breed that is registered as one of Japan’s national treasures. Even the sea salt, Hamamori, comes from a local salt farmer who harvests it on a small island off the nearby port of Hamada. Guests, too, can contribute to the meal by bringing their favorite liquor or one of the local sakes and craft beers that are available at a store down the street (there is no corkage fee). Chef Takuro Onodera on the right preparing dinner with his team in the kitchen at Takyo Abeke. 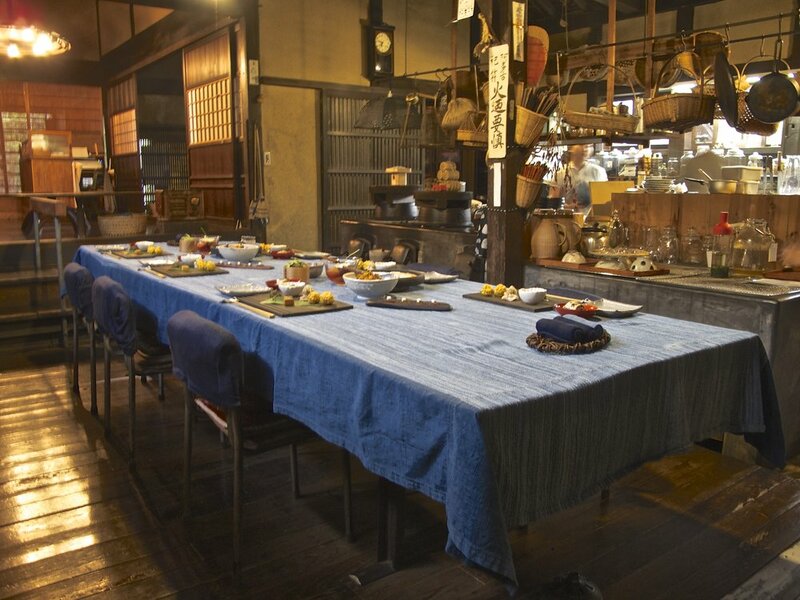 The table in the daidokoro, the large combined cooking and eating area of the house, being set for dinner with an array of hot and cold dishes. Behind the table is the kamado, the traditional low wood-burning stove, which separates the eating and cooking areas. Mizuho Ohkouchi, manager of Takyo Abeke, lighting the wood fire in the kamado, or traditional wood-burning stove. Mizuho Ohkouchi, manager of Takyo Abeke, signals the start of dinner when she lights the wood fire in the kamado and begins making the rice. Dinner ends hours later when she shapes the rice into onigiri rice balls for each guest. From the start the table is laden with an array of hot and cold small dishes. Small bright red tomatoes peeled and marinated in black vinegar and maple syrup. Squares of lightly-fried green and white fu wheat dumplings. Black home-made squares of yubeshi, a fermented glutinous rice and yuzu paste, topped with smaller squares of cream cheese. A medley of seasonal vegetables, a spicy salad of ito konnyaku noodles, and always a seasonal pizza topped in spring, for example, with bamboo shoots, peppery sansho miso paste, iwanori seaweed, and cheese. This is followed by a procession of dishes. Although there is a set menu, Taku seems to cook as long as guests are hungry or to make something extra he thinks they might like. The dishes are a combination of traditional, home-style, sometimes nearly-forgotten recipes Tomi has learned in Omori and dishes that reflect Taku’s constant experimentation and creativity in the kitchen. What they have in common is the skillful incorporation of hakko-shoku, or fermented foods. Fermentation is fundamental to Japanese cuisine. It started out as the main way of preserving food in Japan. It quickly became a key ingredient because of the many new appetizing flavors that are created when fermentation converts starches, sugars, and carbohydrates into tangy-tasting lactic acids and breaks down proteins into rich-tasting amino acids like glutamate, a natural form of umami. Fermentation is also good for you because it increases the nutrients in food including amino acids, probiotics, isoflavones, and essential enzymes. Almost every dish at Takyo Abeke is enhanced by fermentation, being either a fermented food itself or prepared with a fermented sauce or finished with a fermented condiment. Many of these are home-made at Takyo Abeke including a range of flavored miso pastes, tsukemono, or fermented vegetables, and the very labor-intensive yubeishi. Soy sauce, miso, sake, rice vinegar, and mirin are all fermented seasonings, and a combination of some of these are used to braise a whole nodogoro fish in a style called nitsuke. Black vinegar is splashed on fresh vegetables and fruits. Highly acidic and rich-tasting ishiri fish sauce is made into a marinade for chicken livers and seseri—the deeply flavorful neck meat of a chicken. Creamy sweet white miso is blended into a cauliflower puree which becomes the bed for a matodai fish fillet that has been pan-fried in a rice cracker crust. The bright rich peppery taste of kinome miso paste, which is made from the leaves of the sansho citrus bush, is dabbed on seared cubes of beef. The salty lemony taste of yuzu citrus miso paste is slathered on onigiri rice balls, which are then wrapped in crisp nori seaweed. The final course is onigiri rice balls served with tsukemono, or fermented vegetables, and a soup, which might be a piece of fermented fish in a bowl of smoky-flavored kuromoji herbal tea. Made from the Lindera umbellata plant, or spicewood bush, kuromoji tea is a specialty of Shimane prefecture, and helps settle the stomach and aid digestion. Dessert is often ice cream made from the gyokuro tea leaves that were used to steep the deliciously rich green tea served as a welcome upon arrival. Reusing the tea leaves like this is both responsible and nutritious. Green tea leaves contain a full set of vitamins from A to E; you consume vitamins B, C, and E when you drink the tea and A and D when you eat the leaves. The next day begins with breakfast, a more subdued although no less hearty meal, typically consisting of traditional local foods and dishes. By breakfast, guests feel like family. Takyo Abeke lives up to its name "takyo" or "one's second home," and even as you are leaving you find yourself planning your next visit there. Breakfast in spring at Takyo Abeke includes okayu rice porridge, grilled river fish, and a local specialty of hardened tofu that is cut into strips and served like noodles in a thick and savory dashi soup. Front courtyard and main entrance to Takyo Abeke. Takyo Abeke's three sets of bedroom suites can accommodate one to four guests each. Check-in time is 15:00 and check-out 10:00. The guest house is closed on Wednesdays. You can call or make reservations online using this website: https://kurasuyado.jp/takyo-abeke. Choose “English” on the right-side bar for a list of available rooms and dates and then proceed to booking. Although located in a remote, wonderfully unspoiled part of Japan, Omori is not difficult to get to, and there are two relatively easy routes. One is from Hiroshima City. Two buses a day go from Hiroshima directly to Omori, and the ride is a relaxing 2 1/2 hours across a stretch of beautiful mountainous terrain. The other route is from the town of Izumo in the northern part of Shimane prefecture. Izumo is the home of the Izumo Taisha Grand Shrine, one of the most ancient and important shrines in Japan. Trains regularly go from Izumo to the coastal town of Oda, near to Omori, in about 30 minutes. Someone from Takyo Abeke will gladly pick you up at Oda if you arrange for this in advance. The ride from Oda to Takyo Abeke is around 20 minutes. Shimane has very well-maintained roads on which there is very little traffic, making renting a car and driving a great way to get around. Main entrance to Gungendo's flagship store in Omori. Officially known as the Iwami-Ginzan Seikatsu Bunka Kenkyusho Corporation, the Gungendo company's flagship store occupies a set of beautifully renovated buildings along Omori's main street. The complex includes a charming cafe that features seasonal and nutritious dishes made with local ingredients. Open 10:00 (cafe from 11:00) to 18:00 every day except Wednesday. Iwami-Ginzan Gungendo Kitte - Located in the Kitte Building, which is directly across from the Marunouchi South Exit of Tokyo station. Open 11:00 to 21:00 every day. Gungendo Coredo Muromachi - Conveniently located in the Nihombashi department store area. Open 10:00 to 21:00 every day. 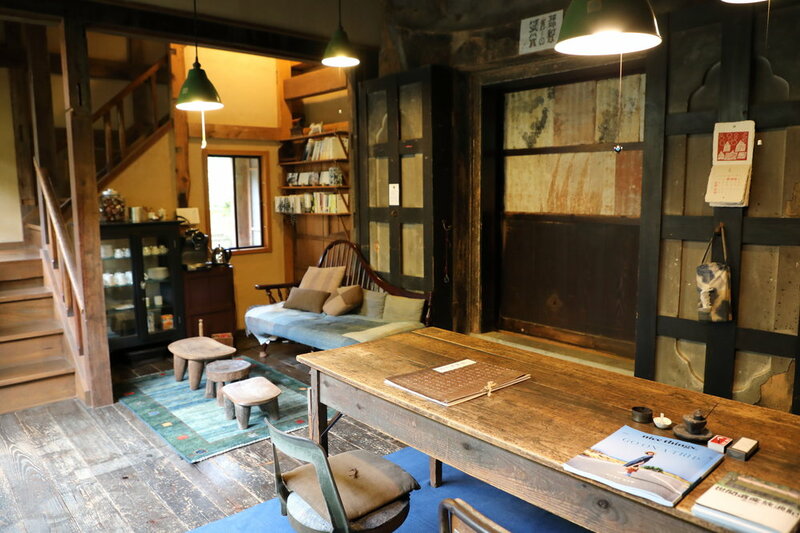 Curate Re:gendo - Located in an 80-year-old building in Ogikubo that was restored by local craftsmen from the Omori area. It includes a cafe. Open 11:00 to 19:00 (the cafe is open until 21:00) every day except Tuesday. Open 10:00 to 20:00 every day. Tomi Matsuba, president and designer of Gungendo, divides her time between the company's Omori headquarters, Tokyo operations, and stores located throughout Japan. The Iwami Ginzan UNESCO World Heritage Site consists of three areas: the ruins of the silver mine, Omori village, and the nearby spa town and port of Yunotsu. Iwami Ginzan Silver Mine - Opened in 1526, the silver mine was once the largest in the world and had a significant impact on the economies of East Asia in addition to that of Japan. In the forest along the upper valley beyond Omori are the remains of mine shafts and tunnels, administrative buildings, and massive stone embankments and fortifications. Cars are not permitted in the area to protect the integrity of the site as well as the environment, and the 2.3 kilometer journey from Omori to the entrance of the mines can be very pleasantly done by foot or bicycle. 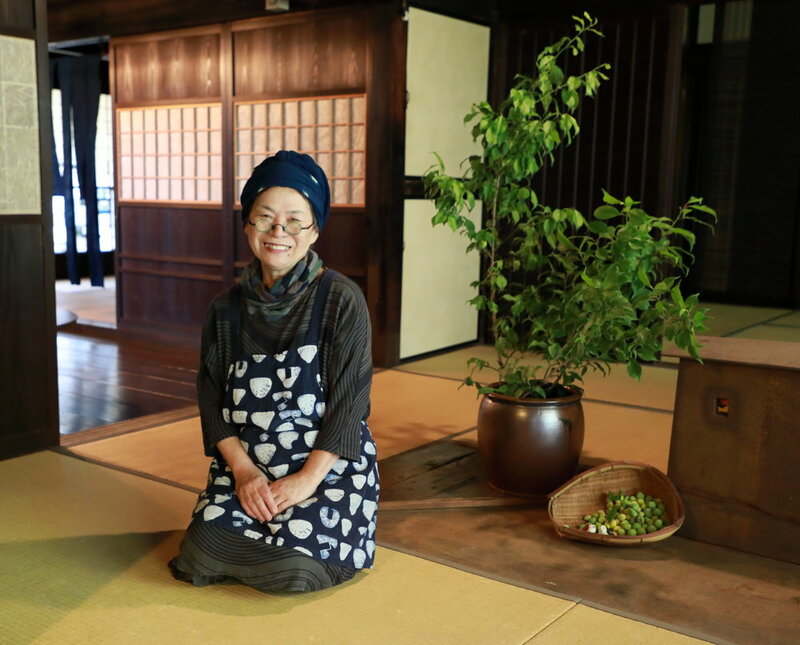 Omori - The Matsubas have led the revitalization of the village through their successful business and also by working to preserve its heritage and help make it one of the most beautiful, well-cared-for, and visitor-friendly villages in Japan. They have restored a variety of old buildings in the village including Mujaku-an, a small rustic worker's house along the main road that can be visited by guests of Takyo Abeke. Kumagai Residence - The grandest of Omori's old homes, this used to be the residence of a leading merchant. It is exceptionally well restored, and the home is filled with 3,300 household items from the family's life in the house during the late Edo period (1603-1868). Kigami Shrine - This important Shinto shrine is one of the few remaining buildings in Japan that were once used as both a shrine and Buddhist temple before the two practices were officially separated by law in 1868. The duality is still visible in the combination of classic Shinto shrine architecture for the structure and Buddhist decorations inside, including the iconic Zen Buddhist dragon painted on the ceiling of the main hall. 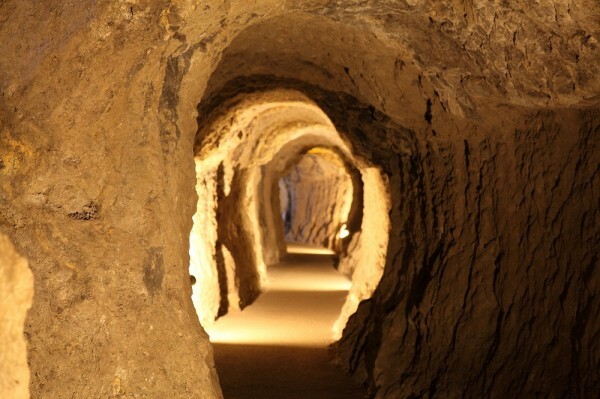 Two of the approximately 600 original silver mine tunnels are open to the public. The spaciousness and sumptuousness of the Kumagai residence reflect Omori's prosperity during the silver mine's heyday. The colorful and exuberant painting of a Zen Buddhist dragon on the ceiling of the main hall of Kigami Shrine is characteristic of the grand yet rustic style of old religious buildings in Shimane prefecture. Yunotsu Onsen - Located about 20 minutes away from Omori by car and 45 minutes by bus and train, Yunotsu Onsen has a 1,300-year history as a spa town in addition to being Japan's busiest port during the 16th and 17th centuries. 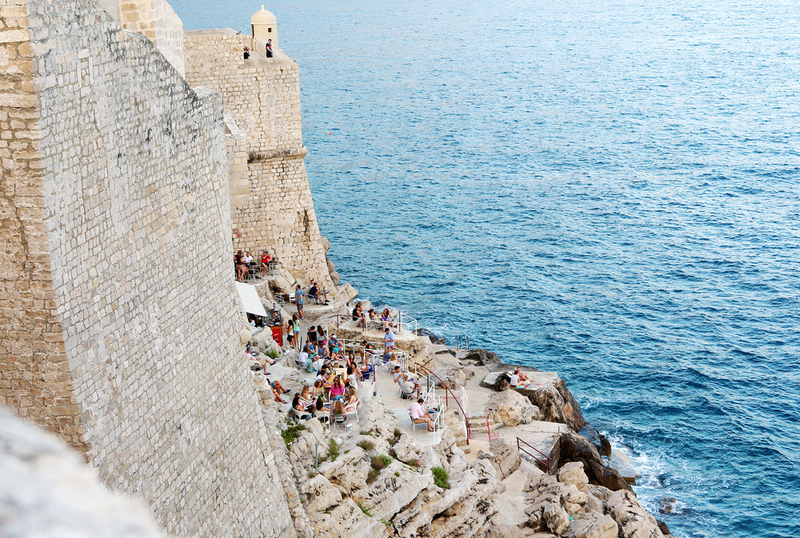 Today it is a small, quiet fishing village and hot springs resort that is almost hidden among the area's lush hillocks and rocky coves. It has many good, old-fashioned hot spring inns, some of which can be enjoyed for a daily-use rate as well as an overnight stay. Takyo Abeke can easily be your home base to explore central Shimane prefecture and enjoy the area's many small towns and villages, historic treasures, restaurants, hot spring resorts, beaches, and mountains. Essentially a ribbon of dramatically beautiful mountainous coastline facing the Sea of Japan, Shimane prefecture is one of the oldest settled regions in Japan. After the focus of Japanese society shifted to the Pacific Ocean side of the islands in the Edo period (1603-1868) it became a sparsely populated hinterland. It also missed out on the urban and industrial developments of the Meiji period (1868-1912), leaving its landscape remarkably unspoiled. Today travel in Shimane is as much about experiencing and enjoying its beautiful landscapes and way of life as it is about sightseeing. There is an abundance of good food from sea and land, nighttime exhibitions of ancient Shinto kagura dancing, hiking, cycling, and swimming, and the gentle slow way of life of Shimane's towns and villages. The simple white plaster walls and red-tiled roofs of a typical Shimane farm are an attractive and discreet contrast to the prefecture's unspoiled landscape. Mt. O-Sanbe, the highest peak in the prefecture, is in the distance. Onan - A market town spectacularly located Shangri-la-like in a mountain basin about 45 minutes from Omori. The town and surrounding farms are famous for their commitment to producing some of the best agriculture products in western Honshu Island, including Shimane wagyu beef, Sixth Produce dairy products, and a diverse range of vegetables and fruits. In addition to supplying restaurants as far away as Hiroshima City, Onan's farmers have inspired the creation of a number of excellent local restaurants. Housed in a renovated old sake brewery, "Ajikura" is one of these, and people come from afar to enjoy its food. The quality of its ingredients, creativity of its Japanese-Italian cuisine, and attentive service make it well worth the journey. Multi-course meals are served during both lunch and dinner at Ajikura. Mt. Sanbe - A ridge of seven volcanic mountains in Daisen-Oki National Park, Mt. Sanbe is located about 35 minutes from Omori. There are excellent trails for cycling, hiking, and climbing or you can explore the area's many farms and have a relaxing picnic among its grassy valleys. At the top of the main peak of the ridge, called Mt. O-sanbe, is Sanbe Burger, a restaurant serving an all-natural burger made with the best local ingredients and considered by many to be one of the best burgers in Japan.